Babu Damber Singh Gurung was born at Kalimpong on this auspicious day ie; 23rd January 1900 as the son of Shri Yuddhabir and Manmaya Gurung and the grandson of Dhanbir Gurung commonly known as Bheriwal Mandal who was at Kalimpong since 1859. At that time Kalimpong was also known as "Dalim" which was occupied by Bhutan from Sikkim in 1707. He studied at Government High School, Darjeeling and after Matriculation, he joined Scottish Church College, Calcutta and after graduation, he completed Law. He was elected to the Bengal Provincial Council from Darjeeling District as the then British Government had passed Government of India Act 1935 and declared Darjeeling as Partially Excluded Area. 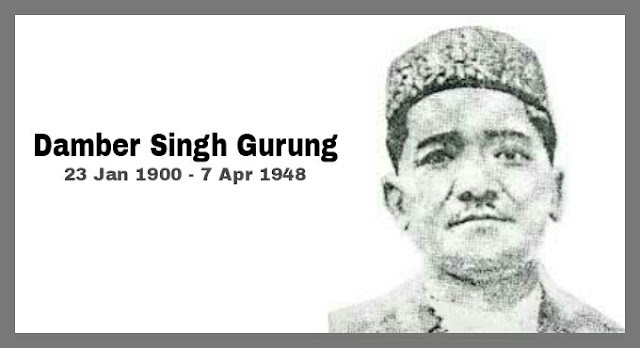 He founded All India Gorkha League on 15th May 1943 and he was unanimously elected the President of AIGL. He was the first Indian Gorkha to set his foot on the floor of Parliament as the member of Constituent Assembly. He died of Tuberculosis on 7th April 1948.